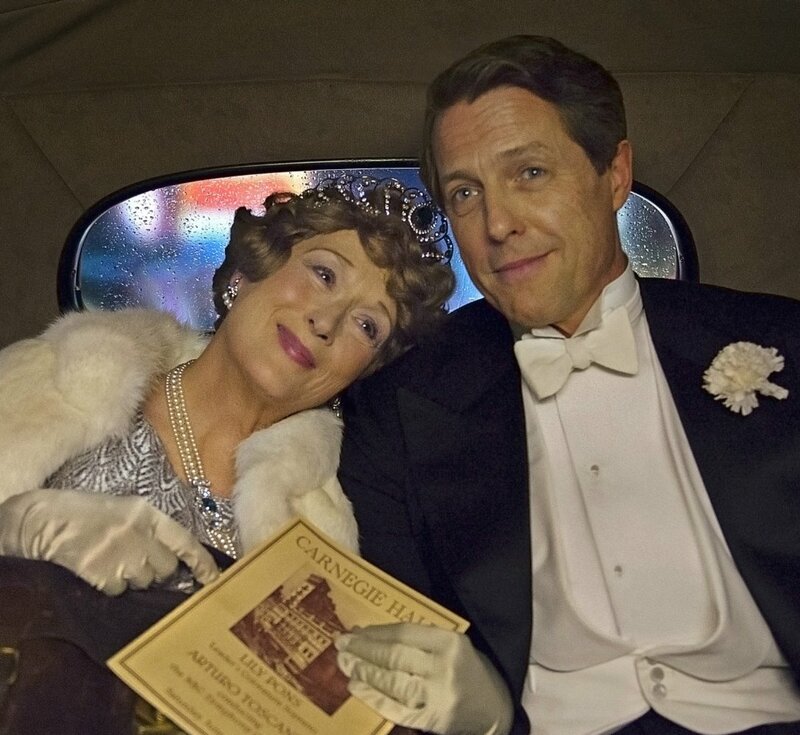 Hugh Grant and Meryl Streep always had different types of roles, ideas, and an approach that would not stop amazing us. Yet, Hugh Grant’s gentle and romantic look and unique charisma, and Meryl Streep’s vision would have made us dream to see them in a film together. And that great moment has finally arrived in a deep, profound, incredibly funny and in the meantime, touching movie, FLORENCE FOSTER JENKINS that will from one moment to another make you laugh so hard that tears will be running down. When the movie begins, and the beginning of it is quite amusing, you find that St Clair is a former actor who now helps his wife to take the stage. Shortly after, we find them in such a sweet harmony when he with great care, love and admiration after reading a poetry sends Florence to deep sleep, just for us to find out that she is severely sick. Does it mean that just because of her illness, her husband agrees with anything she says and works on her dream to make it come true? The answer is no. St Clair is in such love with his wife that he does not hear or is even aware of her having a terrible voice, as he loves everything in her – even the voice many of you may find laughable. As the story unfolds, you find another incredible character, Cosmé McMoon portrayed by extremely talented and underrated actor, Simon Helberg, who from now on should get only big roles. Even Nina Arianda as Agnes Start despite not having a major part in the film, will make you hate her in the beginning and applause in the end. And of course, Meryl Streep will literally make you laugh without saying a word by the way of her singing, that is literally is one of the most priceless, genuinely beautiful scene I’ve ever scene in my whole life. Even the production, costumes, and cinematography is quite outstanding and literally transports you to 1944 when Florence Jenkins hit the Carnegie Hall. The script written by Nicholas Martin is unquestionably perfect. It describes little nuances in such a way that allows something like Meryl Streep, Hugh Grant or Simon Helberg to master them easily. Stepher Frears as a director, perhaps, had little to do, but delivered big movie with multiple paces. One moment you laugh, the next one makes you cry for two different reasons. But more importantly, this film unites the audience in the theater, as you may find yourself applauding to Meryl Streep throughout the film. But after seeing her one of the most remarkable performances, how could you not recognise that? In conclusion, FLORENCE FOSTER JENKINS is a gentle comedic story of love, devotion, determination and deceit, when one man brings to pedestal a woman who had no singing ability. But what Florence Jenkins says in the end is what will be remembered forever – “People might say I could not sing. But surely, they will never tell that I did not.” So, by the time when the film ends, you will feel extremely grateful that Florence Jenkins was brave enough to do something incredible that now, because of that, your movie evening will be complete.